It is unusual for me to read a book after seeing the movie … I prefer to do it the other way around. Then, since the movie is never as rich as the book, I can add scenes as I watch the movie. But something compelled me me to read this novel after seeing the movie. As much as I enjoyed the beautiful cinematography of Call Me By Your Name, the excellent acting, and the grip of the love story, I felt that the movie was more about what occurred than about the emotions of the two main characters, Elio and Oliver. I hoped the book would shed some light. From the very first page, I was not disappointed. 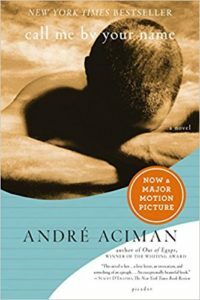 I found myself wanting to watch the movie again with this book in hand … the movie did such a beautiful and profound job of communicating the external story, and the original novel did an exquisite job of communicating the internal landscape. Elio, the only child of a literature professor and his wife, spends summers with his parents in a home in a small village in Italy. Every year Elio’s dad invites a student, a protégé of sorts, to spend the summer with them, doing paperwork and correspondence, as well as research and study. The setting, the weather, the town – all are idyllic. This summer Elio is 17, and the guest student is 24-year-old Oliver. This book is the story of their love ... the long slow path to its consummation, and the intensity of its passion and intellect. This is one of the most sensual books I have ever read. Aciman is a master. It is also beautifully written, with lovely words and phrasing. If you have seen the movie and liked it, I think you will enjoy this book as I have. If you have not seen the movie, I don’t know how well the novel will land. The story line is simple and rather slow. I just can’t tell if it would be a good read or not. If you read it, let us know! This is on my movie list so I think I will go that route. I think I will see the movie, based on your review. Thanks for sharing this one. I thought it was a beautiful movie! And welcome to my blog, my friend!